I call this one CHEAP because I like it when Chinese food is delicious and a great bargain. My favorite meal for Chinese food is lunch. Now, this will tell you how long I’ve lived in Reno, NV. I have been going to the same Chinese food restaurant for 30 years. 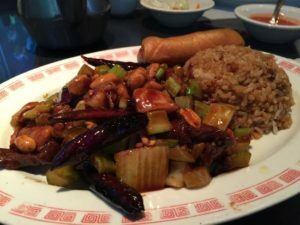 Szechuan Garden is not elegant but it is nice, clean, and the food is excellent. I love their hot & sour soup, their mu-shu pork, and their kung-pao chicken. The ownership has been the same since the mid eighties and they’re a wonderful family. I highly recommend that you try them for lunch or dinner. They’re located on Moana Lane near Lakeside. Don’t let the name fool you. The Santa Fe Hotel has no rooms. What they do have is an old school Reno bar serving excellent basque cocktails and a dining room where you can have some of the best family style dining of basque food in all of Nevada. I have to admit, I rarely eat in the dining room. We choose instead to sit in the bar and have cocktails and order items off the menu. Like ribeye steak and fries. This is a seriously great place for a steak. They really knock it out of the park. Santa Fe, just like Szechuan Garden, is not elegant. In fact, far from it. But the food is delicious and the place feels like a throwback to the forties or fifties. Ownership and staff are very friendly and helpful. If you’re daring, drink some picon punch and order up some appetizers. You’ll have a great time. 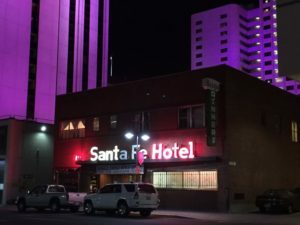 The Santa Fe Hotel is located downtown, on Center Street, on the east side of Harrah’s. 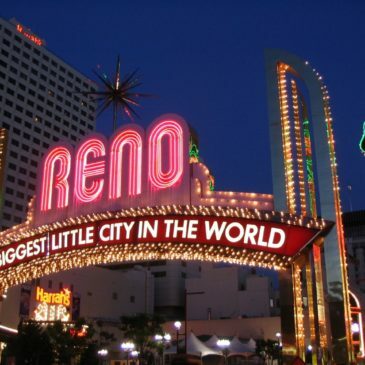 Harrah’s is actually built around this iconic Reno landmark. 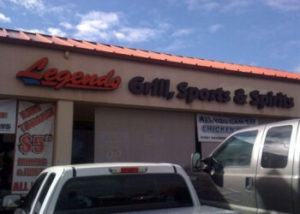 Legends Sports Bar is on Virginia Street in the same shopping center as Whole Foods. Legends is not super special. But they have plenty of televisions and comfortable booths. But the reason I like going there is for the chicken wings. They’re probably my favorite chicken wings in all of Reno. My favorite is their dry rub cajun wings. Totally delicious. And they serve a massive plate of fries to go along with them. To balance out the meal, their side salad is delicious too. Dr Potts chiropractic office is called “Mt Rose Chiropractic” and is located on Moana Lane, just west of South Virginia by one block. Easy to find. I had to go to Vino 100 after a neighborhood rolling party where two of the homes were serving wine that knocked my socks off. When I asked where they got the wines the answer in both cases was Vino 100. 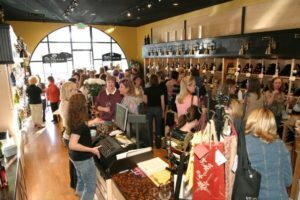 My first time in, I simply went in and bought a case of each of the two wines that I had tried during our Reno neighborhood sip and stroll. What a mistake. On later visits, I got to know the owner, Karen and found her to be a great resource for wine knowledge. She has continuously steered me to great bottles of wine and I’ve had so much fun introducing my Reno friends to these great wines. So, go wonder into Vino 100 and meet Karen. Her place is off Steamboat Parkway in the same shopping center as Home Depot in South Meadows, Reno. / Nexus 7 is indeed good and will have to wait and see how ipad mini comes out after it is released as we have high hopes on it. Kindle fire 2 is expected improvements over the first ve.roinsvicky recently posted..
Good list dude! I will definitely use this source, thanks for sharing. I agree with “Santa Fe Hotel” their steak is the best so far. I like the ribeye steak and I always tell it to my friends that they should try it out. Best of the best! I simply love steak above all. This list is a real help. I will definitely share this with my friends Thanks for sharing. Keep it up! Ohh Reno.. The city that never sleeps. I have a lot of favorite restaurants there. I will definitely be back on Christmas vacation.